DARYL GURNEY lit up the first round of the Peperami Gibraltar Darts Trophy by averaging over 102 in his 6-3 win over David Pallett as the £115,000 tournament began at the Victoria Stadium, where home hope Dyson Parody also reached the last 32. The Northern Irish ace was the runner-up in February’s Dutch Darts Masters event and kicked off his bid for further success on the PDC European Tour by moving through to the last 32 in Gibraltar. Gurney hit the ground running by taking the opening three legs in quick style only for Pallett to bounce back by winning the next two on the bounce. Legs six and seven then went with the throw to leave the match evenly poised at 4-3 to Gurney, but the 30-year-old didn’t give Pallett another chance, and booked his place in the second round winning the next two legs. It was a mixed day for the local Gibraltarian players, but Dyson Parody made sure that the local crowd had something to cheer with a fine 6-3 victory over Dutch youngster Dirk van Duijvenbode. In a scrappy match were both players missed crucial darts at doubles, it was Parody who held his nerve to set up a second round tie against another Dutch ace, former Lakeside Champion Jelle Klaasen. There was disappointment, though, for the other three Host Nation Qualifiers as Parody’s compatriots Antony Lopez, David Francis and George Federico were all eliminated in the first round. Lopez went crashing out 6-2 to Nick Fullwell, Francis was taught a tough lesson being whitewashed 6-0 by Gerwyn Price and Federico was beaten 6-1 by Alan Norris, despite taking the game’s opening leg with a 119 finish. 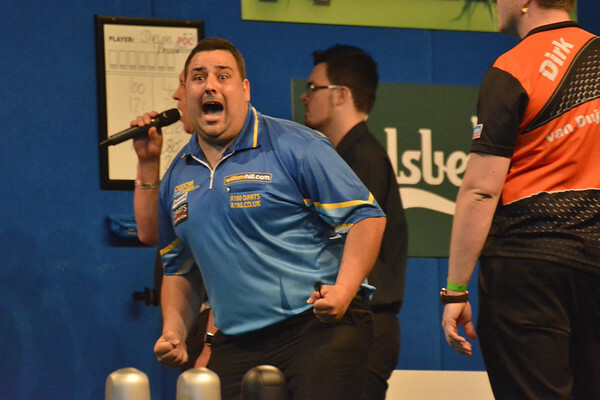 Jermaine Wattimena didn’t hang about in booking his place in the second round of the Peperami Gibraltar Darts Trophy with fluent 6-2 victory over Rowby-John Rodriguez, averaging 94.26 and hitting 60% of his doubles. Wattimena wasn’t the only Dutchman celebrating an opening round success, with Christian Kist taking advantage of some sloppy darts from Cristo Reyes to beat the Spaniard 6-1. Stephen Bunting also enjoyed a 6-1 victory in his match over Mark Walsh. Bunting raced into a commanding 5-0 lead and then secured his victory in leg seven to set-up a second round tie against Benito van de Pas. Elsewhere in the first round, Joe Cullen overcame Kevin Painter 6-5, Max Hopp beat Andy Hamilton 6-4 and Steve West recorded five maximums in his 6-4 victory over Kyle Anderson. In the afternoon session, Justin Pipe made short work of the youngster Jamie Lewis, a former Gibraltar Darts Trophy finalist. Former Austrian Darts Open champion Pipe started the match in style landing his first of three maximums in the match and then never looked backed, averaging 96.97 in a 6-0 demolition job. Wayne Jones will be licking his wounds having missed 13 match darts in his 6-5 defeat to John Henderson. The victory sees Henderson set-up an-Scottish affair in the second round where he meets Robert Thornton in the opening match of Saturday’s afternoon session. The day also saw Joe Murnan defeat Ross Smith 6-2, Austrian qualifier Michael Rasztovits overcome the 2014 runner-up Steve Beaton 6-4 and Antonio Alcinas see off Stuart Kellett 6-1. The withdrawal of Adrian Lewis for personal reasons from the tournament means that his scheduled second round opponent, World Youth Champion Hopp, now receives a Bye through to the last 16. The Peperami Gibraltar Darts Trophy is available to watch worldwide for all http://www.LIVEPDC.TV Subscribers. Live Scores will be available at the PDC Live Scores website, http://live.dartsdata.com . NB: Max Hopp receives Bye in second round following withdrawal of Adrian Lewis.